The toasted coconut took it to another level of goodness! I’ve been living in Hawaii for 14.5 years now. It took me that long to finally be prepared for a hurricane. Meaning, I do have a hurricane preparedness kit, a ration kit, and a kit for both woofers, both with their own first aid kit and medical kit. Like I said, I am prepared much more than when I first arrived on the islands. Today’s blog can easily be a list of “How to’s” for such a weather event and luckily it isn’t. I’m going to share how I’ve been getting rid of my perishables in the refrigerator. The worst part of a hurricane is when you aren’t paying attention to the weather and you go to the market a few days before load up your fridge and then the power goes out for a whole day or maybe even for a few days. All that money you spent goes right out the door. It’s frustrating! No. 1 Keep up with the weather during hurricane season. If the power goes out due to high winds, getting the Costco organic eggs probably isn’t a good idea. I was actually at Costco yesterday and I was about to buy eggs and i realized i have been trying to use up all my eggs in case Hurricane Lester decided to grace his presence on Oahu. No. 2 Use up most of the perishables in the fridge. Usually people have eggs, cheeses, milk etc. I had the eggs and the milk and heavy whipping cream. While trying to figure out what to make, I found a Duncan Hines chocolate cake box expiring in a couple of months. My first thought, cupcakes….with no frosting? This plan doesn’t seem to be working out. Then I realized had a pretty full pint sized opened heavy whipping cream. I have my frosting!! Fresh homemade whipped cream. My Nutella was to expire in a couple of months, a perfect filling for the center. Keep it as is or add coconut? My good friend Laureen says toasted coconut! Oh yah! 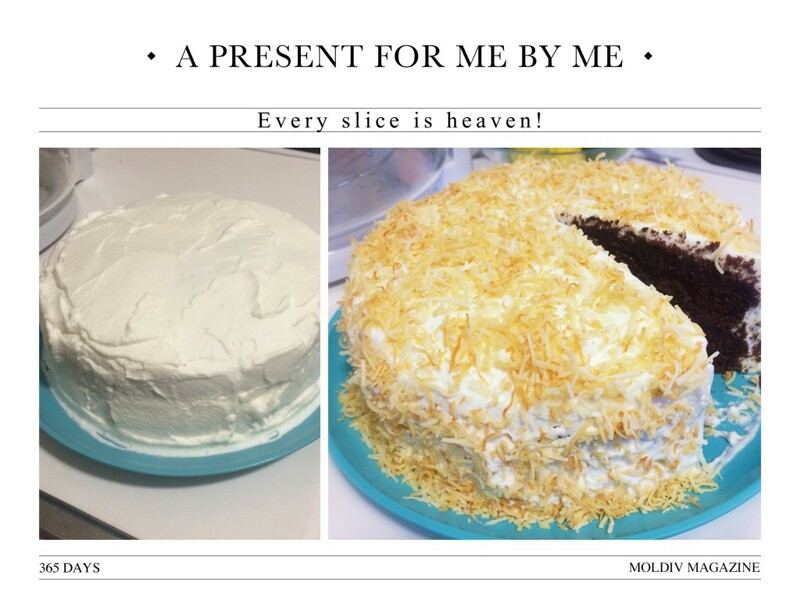 Once I had my cake frosted, I asked my Facebook friends to help me decided to put shredded coconut or not. Everyone said yes to coconut and one said to toast the coconut. Oh My Goodness!!!! It took this cake to another level. A great suggestion from my friend Laureen. Thanks girl! So if Hurricane Lestor decided to visit. I figured I would enjoy his company with some cake! Since the Hurricane warnings were lifted seems no unexpected visitors this Labor Day Weekend. Keep in mind it’s still Hurricane Season. A treat for me while waiting out the possible hurricane and enjoying every heavenly bite! Preheat oven to 325 degrees if using a dark cake pan. Mix cake mix according to package directions. Combine caek mix, eggs, oil, and water in a bowl and mix for 2 minutes. Cook for 27 min in two 8 in round pans that are well greased and lightly dusted with flour. Let cool before frosting. 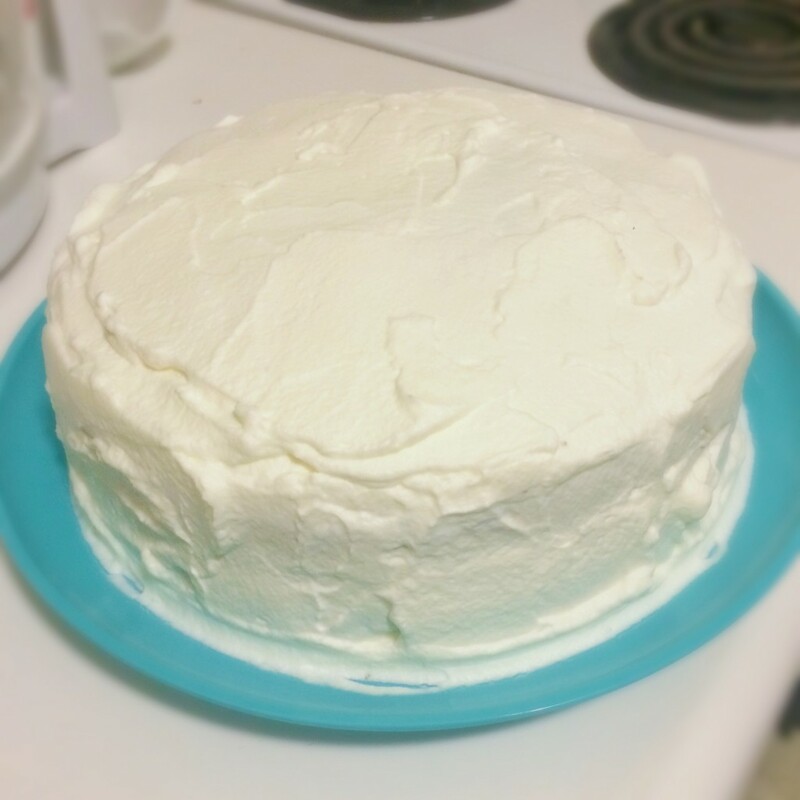 Once cooled, cut cake top if necessary to make the cake level. Spread Nutella on the bottom layer of the cake making sure you get close to the edge but not all the way. Gently lay the other cake on top. Mix the Heavy whipping cream and sugar till you get stiff peaks with a mixer. Frost your cake. Toast Coconut at 300 degrees on a cookie sheet. Watch it to prevent it from burning. Once toasted remove from pan to cool. 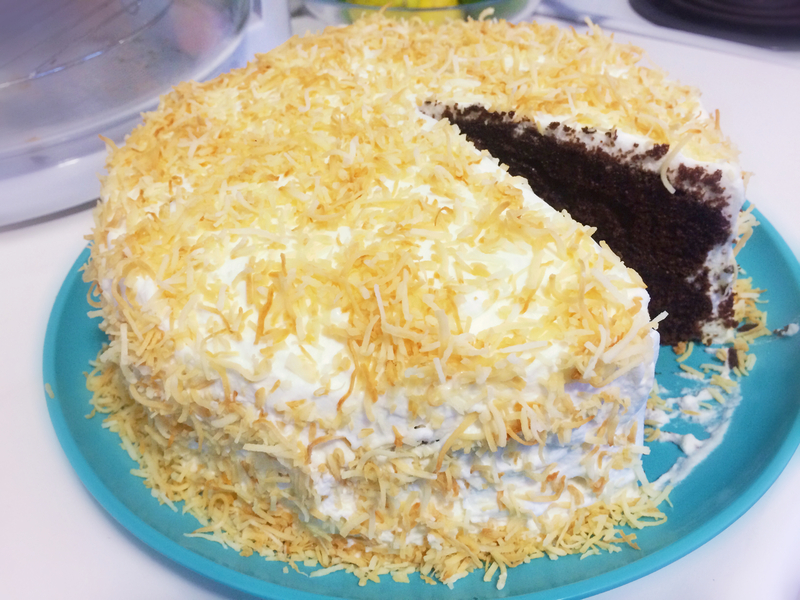 Sprinkle cake with the toasted coconut.